Prime Day has come and gone. And as much as I love a good deal — like the Instant Pot I purchased because I have a strange obsession with kitchen gadgets — I love handmade items even more. I love finding unique pieces at craft shows and even at the thrift store. One of my favorite gallery wall purchases is a set of four embroidered nature scenes. Each 12 by 12 scene is a different season and the stitch work is gorgeous! Of course, the go to for handmade items these days is generally Etsy! I adore Etsy — after all, I am an Etsy seller. 🙂 But I love admiring so many artists’ work and seeing the wide array of products so I frequently just browse and admire. Ah, the joys of modern technology. Before we go too much farther, I should tell you, I love Etsy so much that I became and Etsy affiliate. That means that when you purchase an item I share, I get small portion. This helps me out TREMENDOUSLY! I make my money on-line and though it’s only a small amount, it helps our household. Anyway, back to my browsing. 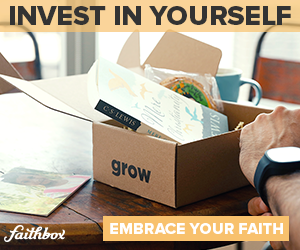 I want to share with you ten faith based items that I’m loving right now!